Note the distinctive bill knob on this male bird which separates it from the female. 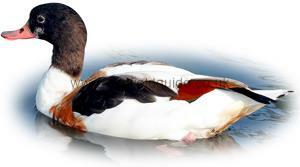 The prominent rust brown breast band and white underside makes the shelduck easy to identify. 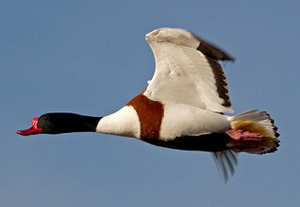 The Shelduck is a medium sized goose like duck with boldly patterned plumage, mostly white with rust brown breast band and black head and upper neck. Migratory in the North, resident in large parts of Europe, tends to change habitat according to season. Breeds along seashores and larger rivers and lakes, feeds in shallow water. Can often be found a long way from water on farmland. 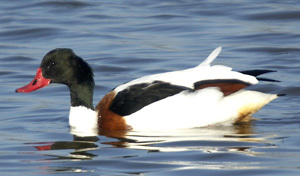 The Shelduck looks more like a small goose than a duck with it's long legs and neck. Easy identified due to it's distinctive plumage it is unlikely to be confused with other birds. Nice footage of a male Shelduck feeding. The female Shelduck is very similar to male but with no bill knob and is generally smaller than the male. The bill is often duller than the male. Note the distinctive rust brown breast band and long goose like neck.